According to Millicent Pitts, CEO of Ocean Exchange, Stanford’s team, Opus 12, edged out seven other collegiate teams to take home the $10,000 cash prize. Its winning sustainable innovation, “Renewable Fuel Production from Carbon Dioxide,” uses technology developed at Stanford University to take carbon dioxide and convert it into usable fuel, ethanol, which can then be used by oil refineries and corn ethanol plants. During the competition, teams from around the nation had three minutes to pitch their sustainable innovations that improve economies, health and the environment to a panel of four members with varying backgrounds in transportation, agriculture, mining and construction, among others. A panel of three review team members with skills in research and development, business development and marketing selected eight teams to advance to the finals. The finalists pitched their ideas to four distinguished panelists who questioned and judged the teams, and the crowd of 100 delegates in the audience also voted for the winner. Following the eight pitches, the delegates mingled with the finalists during a reception, where they further questioned the teams before voting closed. BIG Pitch facilitates the adoption of undergraduate and graduate innovations that improve economies, health and the environment. 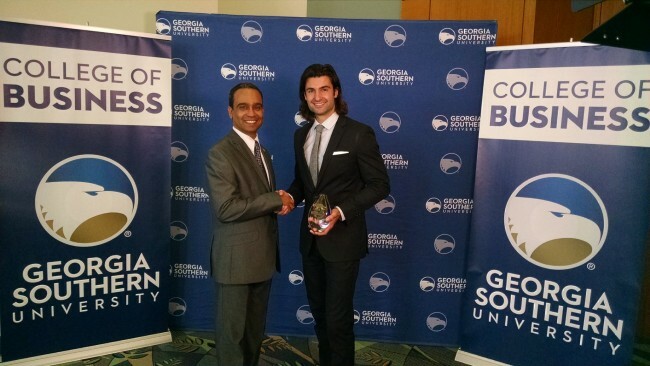 BIG Pitch is part of the Business Innovation Group in the Georgia Southern College of Business and partners with Ocean Exchange. For more information on the BIG Pitch Competition, the Ocean Exchange or Georgia Southern University entrepreneurship programs, please contact Millicent Pitts, CEO of Ocean Exchange, at 912-257-0209 or email at millicent.pitts@oceanexchange.org; or Dominique Halaby, D.P.A., director of BIG, at 912-478-2733 or email at dhalaby@georgiasouthern.edu.